Pope Francis continues to surprise us. 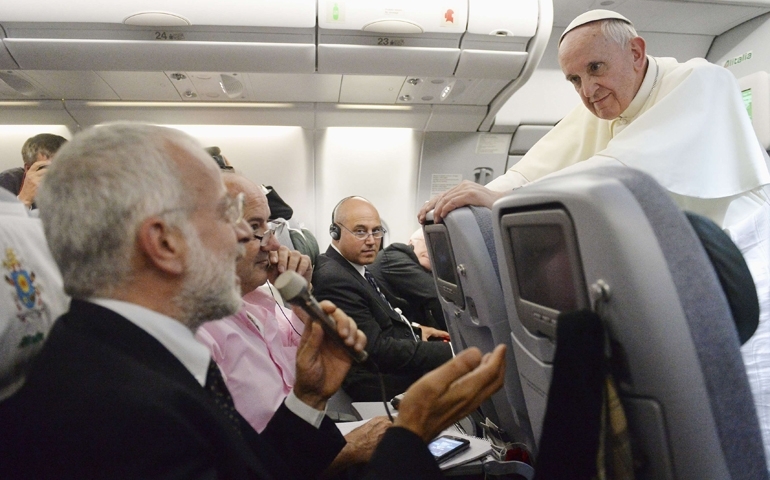 First it was the July “who am I to judge” airplane conversation with reporters during the twelve hour flight from Rio to Rome. Now it is the more extensive interview conducted in August and published simultaneously in a number of Jesuit publications. The most recent interview was conducted by Antonio Spadaro, S.J., editor in chief of La Civiltà Cattolica, the Italian Jesuit journal. Spadaro conducted the interview on behalf of La Civiltà Cattolica, America and several other major Jesuit journals around the world. I wonder……. It seems to me, as an historical theologian, that there have been a lot of changes over the centuries in Catholic moral teaching. And I am sure more changes are on the horizon…. Official Catholic teaching has always given the impression that Catholic moral teachings can never change because these teachings are based on God’s law. Certainly Popes John Paul II and Benedict XVI insisted on this approach and understanding. In fact, however, the Catholic Church has changed its moral teachings over the years on a number of issues. For more than 1,800 years the popes and the church did not condemn slavery. Up until the 17th century, popes, in the very strong terms, condemned making loans with interest. What about Catholic misogyny? Early Christian writings by great bishops and doctors of the church like Augustine, John Chrysostom and Thomas Aquinas are prime examples of the negative perception of women that has been perpetuated in Catholic teaching and practice. Papal social teachings have change significantly in the last two hundred years. Pope Gregory XVI, for instance, in an 1832 encyclical condemned freedom of conscience in society as an “absurd and erroneous teaching or rather madness.” Pope Leo XIII condemned “the modern liberties” and opposed the equality and participation of citizens in civic and political life. The people, he wrote, are “the untutored multitude” that must “be controlled by the authority of law.” Vatican II, of course, accepted religious liberty for all human beings. Quite frankly there has been a fair amount of papal and magisterial schizophrenia about changing moral teachings in the Catholic Church. Can Francis change that? Indeed, for me, that will be the big test. Papal schizophrenia…….When one examines issues of civic, political, and economic life, contemporary papal social teachings have stressed history and the understanding that social understandings can and do change with the times. Church teachings now emphasize the freedom, equality, and participation of the person, in what moral theologian Charles Curran calls a “relationality model” that understands people developing in multiple relationships with God, neighbors, the Earth, and self. When it comes to papal and magisterial sexual ethics, however, Catholic teaching regresses to the older no-change methodology. It stresses an unchanging human nature and God’s unchanging eternal law. There is no understanding of human development. Of course, a great many people inside and outside the Catholic Church recognize the dissonance (schizophrenia) between papal / magisterial sexual and papal / magisterial social teachings. One authority but two different understandings and two different methodologies at work in areas where there should be consistency. Changes would logically occur in Catholic moral sexual teachings if these teachings resulted from the same methodology as used in papal social teachings. Indeed, the CDF does not like to hear this but papal sexual teachings, like social teachings, will never be able to claim absolute certitude about complex and specific issues. A final reflection. Church history should remind us that change in Catholic moral teachings has always come from the grass roots. Vox populi vox Dei. When it comes to the papal condemnation of artificial contraception, for instance, the vast majority of Catholics do not follow the pope. And so the discussion about gay marriage, about women’s ordination, about our understandings of Jesus, God, and the church are all works in progress. Thank you for putting this in historical terms. The Spirit does move! In my opinion, Augustine, John Chrysostom and Thomas Aquinas should be stricken from the body of saints for their opinions about women. I suppose that they had the same warped view about Mary, mother of Jesus. I recall my mother’s having to go through a purification ceremony after each of my siblings were baptised. Such mediaeval thinking. Thank God this doesn’t occur today.